The Typhoid IgG/IgM Rapid Test Device is a lateral flow immunoassay for the simultaneous detection and differentiation of anti-Salmonella typhi (S. typhi) IgG and IgM in human whole blood, serum or plasma. Typhoid fever is caused by S. typhi, a Gram-negative bacterium. World-wide an estimated 17 million cases and 600,000 associated deaths occur annually1. Patients who are infected with HIV are at significantly increased risk of clinical infection with S. typhi2. Evidence of H. pylori infection also presents an increase risk of acquiring typhoid fever. 1-5% of patients become chronic carrier harboring S. typhi in the gallbladder. The clinical diagnosis of typhoid fever depends on the isolation of S. typhi from blood, bone marrow or a specific anatomic lesion. In the facilities that can not afford to perform this complicated and time-consuming procedure, Filix-Widal test is used to facilitate the diagnosis. However, many limitations lead to difficulties in the interpretation of the Widal test3,4. In contrast, the Typhoid IgG/IgM Rapid Test Device is a simple and rapid laboratory test. The test simultaneously detects and differentiates the IgG and the IgM antibodies to S. typhi specific antigen5 thus to aid in the determination of current or previous exposure to the S. typhi. The Typhoid IgG/IgM Rapid Test Device is a lateral flow chromatographic immunoassay. The test cassette consists of: 1) a burgundy colored conjugate pad containing recombinant S. typhoid H antigen and O antigen conjugated with colloid gold (Typhoid conjugates) and rabbit IgG-gold conjugates, 2) a nitrocellulose membrane strip containing two test bands (IgG and IgM bands) and a control band (C band). The IgM band is pre-coated with monoclonal anti-human IgM for the detection of IgM anti-S. typhi, IgG band is pre-coated with reagents for the detection of IgG anti-S. typhi , and the C band is pre-coated with goat anti rabbit IgG. When an adequate volume of test specimen is dispensed into the sample well of the cassette, the test specimen migrates by capillary action across the test cassette. 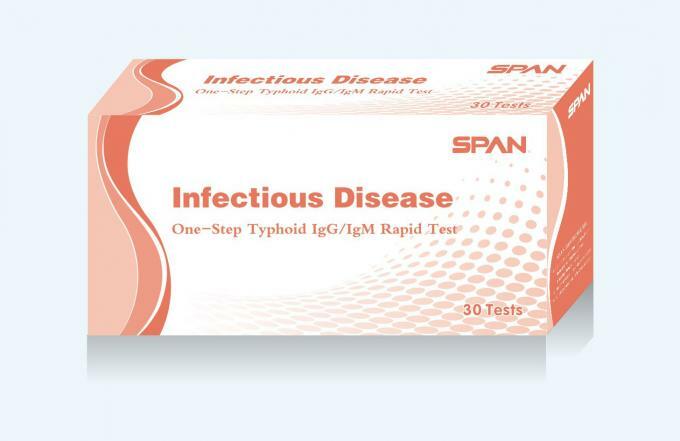 Anti-S. typhi IgM if present in the patient specimen will bind to the Typhoid conjugates. The immunocomplex is then captured on the membrane by the pre-coated anti-human IgM antibody, forming a burgundy colored IgM band, indicating a S. typhi IgM positive test result. 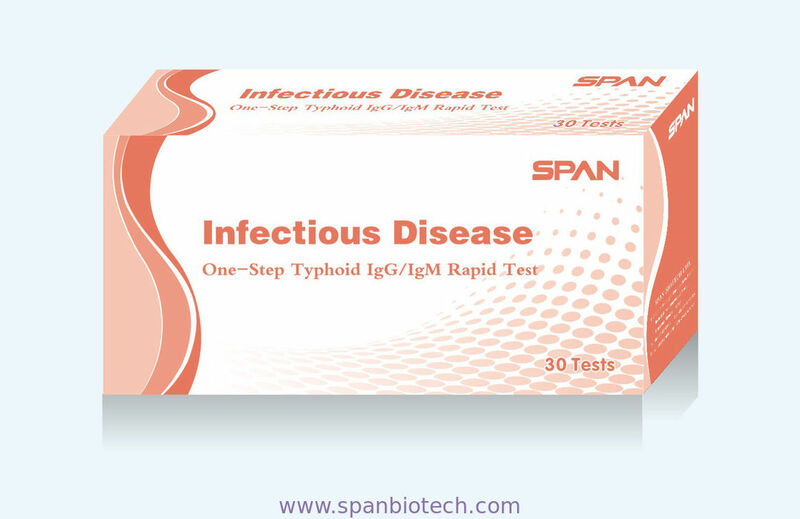 Anti-S. typhi IgG if present in the patient specimen will bind to the Typhoid conjugates. The immunocomplex is then captured by the pre-coated reagents on the membrane, forming a burgundy colored IgG band, indicating a S. typhi IgG positive test result. Absence of any test bands suggests a negative result. The test contains an internal control (C band) which should exhibit a burgundy colored band of the immunocomplex of goat anti rabbit IgG/rabbit IgG-gold conjugate regardless of the color development on any of the test bands. Otherwise, the test result is invalid and the specimen must be retested with another device. 1.Do not use after expiration date indicated on the package. Do not use the test if its foil pouch is damaged. Do not reuse tests. 2.The products should be treated as potentially infectious, and handled observing the usual safety precautions (do not ingest or inhale). 3.Avoid cross-contamination of specimens by using a new specimen collection container for each specimen obtained. 4.Do not eat, drink or smoke in the area where the specimens and kits are handled. Handle all specimens as if they contain infectious agents. Observe established precautions against microbiological hazards throughout the procedure and follow the standard procedures for proper disposal of specimens. Wear protective clothing such as laboratory coats, disposable gloves and eye protection when specimens are assayed. 5.Do not interchange or mix reagents from different lots. 6.Humidity and temperature can adversely affect results. 7.The used testing materials should be discarded in accordance with local, state and/or federal regulations.